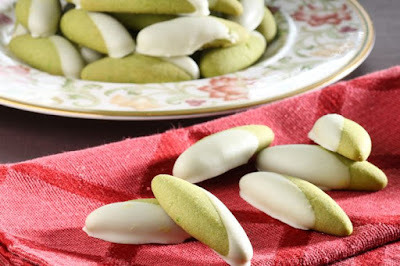 Berhubung toples di rumah lagi kosong butuh cemilan buat nonton bola piala dunia 2018, buat saja kue kering dengan resep Finger Green Tea Cookies untuk mengisinya. Rasa green tea khas dan renyah disetiap gigitan bikin mulut tak berhenti mengunyah, nonton bola jadi lebih asik. Since the jar at home again empty need a snack for the world cup 2018, make a pastry with Finger Green Tea Cookies recipe to fill it. Taste of green tea is typical and crunchy in every bite makes the mouth do not stop chewing, watch the ball so more cool.